Real intelligence when you need it. Your enterprise needs more than just simple web analytics. You need to combine every scrap of data you have on a person, with advanced machine learning and automation to help discover deeper insights for each experience. You need customer intelligence. Collecting data is only half the answer. With Audience Manager DMP, you can gather every scrap of customer data from any source into a single profile—a valuable foundation that is shared across all our products. 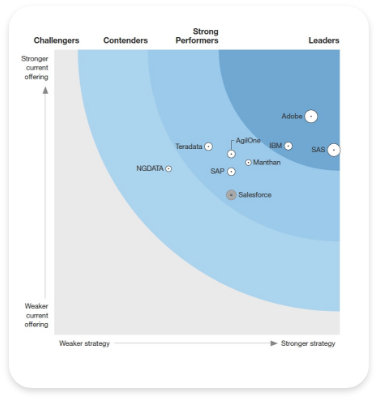 Forrester names Adobe as a Leader in customer analytics. Adobe received the highest score possible in 20 criteria, including action and usability. See why Forrester named Adobe as a Leader in The Forrester Wave™: Customer Analytics Solutions, Q2 2018. Machine Learning and AI: If Only My Computer Had a Brain Wired for Business.